We are mid flight on our way to Miami for the marathon. My training has not been traditional, I didn’t put in the traditional long distance runs, no 20 or 18 milers. But I did put in a few 30+ mi run weeks, had some hard tempo efforts, and I got in some good bike sessions. I felt like the bike really strengthened my legs to handle some of those tempo runs. It also helped get my cardio back after the winter break. Most rides were steady efforts over 2.5 hours. My plan for the marathon is to stick to a 8:15min/mi pace group, keep a steady pace, and recovery quickly. There is a tri season coming! The ride felt great. I really just want to see what this Strava plug in looks like. The great Corporate Holiday structure. I always loved seeing a calendar full of corporate holidays. It meant long weekends, less work, paid days off…and now, extra ride days. 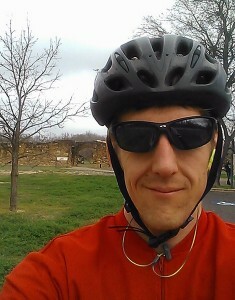 I took advantage of the latest installment of corporate holidays and rode a nice relaxing 22 miles. It was great to not push it (except for a little sprint here and there) and to take in the air. What was especially gratifying was knowing that I am usually cramped up in a cubical staring at my computer screen. Even though I do enjoy my job a ton, I definitely prefer the bike riding option. It is definitely not easy training for a 70.3 while working full time, and going to school, and working side projects. But holidays make great opportunities to add in those extra base miles. The next holiday is not really a corporate one (even though it should be) but we are taking another day off for it. St Patrick’s day will be fun and will be filled with running. And of course some Guinness afterwards. When travel starts to pick up and time away from the comfort of our home increases, spin classes are good. It is kind of nice that there are more and more spin specific studios popping up that make for great ride substitutes. Today we needed to get in a solid 2 hours of biking. Unfortunately we are a few thousand miles from our bikes. So we found a studio and made the trip on a Sunday morning to a local studio in Burbank. Of course we ran out of space in our luggage for our bike shoes. We had to make due with cages and running shoes. I also noticed that the more minimal shoes I grow into, the less comfortable they are on a spin bike. You definitely need support when riding a bike and my Brooks Pure Drifts are not made for that. Don’t worry, I survived. It is also great to experience the different types of spin techniques advocated by the instructors. My usual Thursday class back home has us occasionally get out of the saddle for big hills. Today we started our second class out of the saddle for about 15 minutes. It was quite the workout. So do not let a little travel get in the way of finding a great workout.